One of my favorite things about Dairy Queen is their mysterious and delicious crunchy topping. I’m not entirely sure what the crunch topping is, but it involves sprinkles, nuts, and something akin to toffee bits. I found a tub of the crunch topping at a local baking store called U-Bake. If you’re interesting in making these cupcakes, use the almighty Google to search and I’m sure you’ll be able to source some of the topping. I really do think that if you can’t find something through Google, it doesn’t exist! Anyway, I wanted to make a cupcake that reminded me of Dairy Queen. I went with a box mix for the cupcake and made the icing with ice cream. Yes, ice cream. And it was amazing. I topped the cupcake with the crunch topping. 1. Make cupcakes according to box directions and cool entirely. 2. Make the icing: Allow 1/4 cup of ice cream to sit at room temperature for 10 minutes. Beat butter and cream cheese with electric mixer until light and fluffy. Add vanilla extract and mix to combine. Gradually add powdered sugar, one cup at a time. Mix in ice cream and gradually add milk until you reach your desired consistency. 3. Pipe icing onto the cupcakes. I used a large round tip. 4. 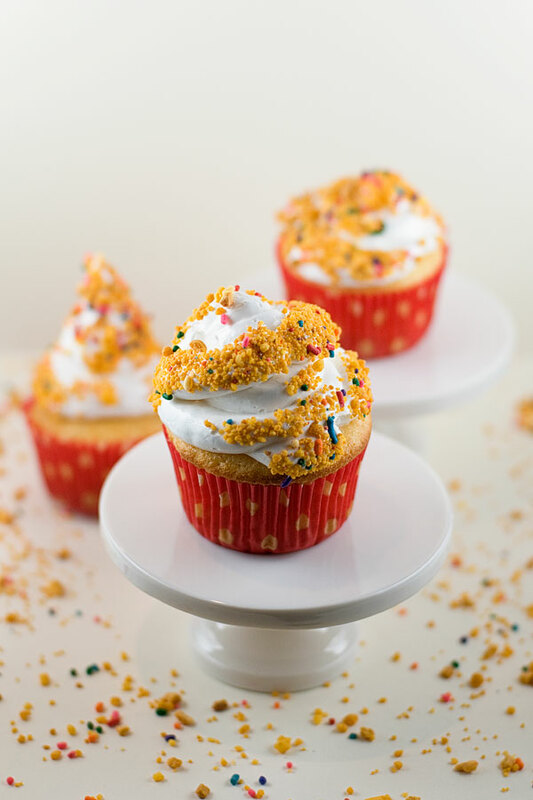 Dip cupcakes into the crunch topping and enjoy!